All week we've been celebrating the release of Captain America: Civil War. Today, the movie releases in theaters, and fans of Marvel are crumpling into despair as a result. But before we lose ourselves entirely to the weeping and gnashing of teeth, let's make a stand. Let's make a decision. Let's declare who we support. Let's pick a side. 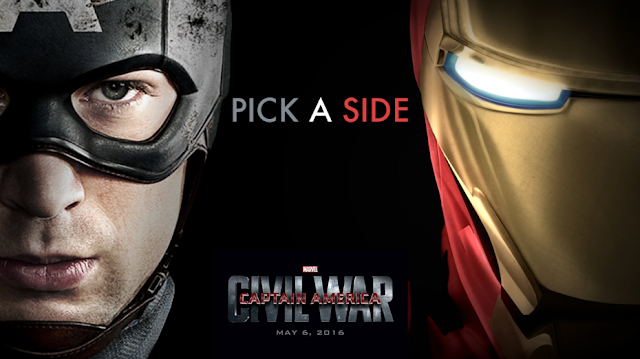 So are you Team Iron Man or Team Cap? Civil War is arguably the most complex, bloody, divisive, and masterfully crafted comic arc in Marvel’s library. Granted, Captain America: Civil War is probably not going to follow it blow-by-blow, but the attention to detail and the spirit of that story will no doubt be honoured. In the comics, Civil War is the story of the now infamous Superhero Registration Act, which was a government mandate requiring superheroes to essentially unmask and reveal themselves so that they could be held accountable for their actions. Tony Stark sided with the government on this, believing that heroes should indeed be held responsible, and Steve Rogers opposed him on the grounds that the Act was in fact un-Constitutional, demanding that heroes basically give up their freedom—or part of it. As stated before, obviously Civil War is most likely not going to follow this line. Anthony and Joe Russo once again helm the Captain America machine as they did for The Winter Soldier, and as both avowed fanboys and seasoned filmmakers—it is my personal belief that as they did with The Winter Soldier, they will not be afraid to pose the hard questions and take this film to realistic and challenging places. I stand with Team Cap—perhaps based for the most part on the Civil War from the comics and the fact that I sided with Steve then. Then—Steve was right of course. And he’s Captain America—as darn near perfect as any human being can aspire to be. But I have reason to believe that given the Russo brothers’ masterful handling of The Winter Soldier, no matter which side you choose there will be a point in the film when you regret your choice…for good reason. When I took TFI's quiz to see which side I should be on in Civil War, my result was neutral, which I think is pretty accurate. It sums up my "I don't want anyone to fight" stance--I'm definitely on Team Hug It Out and Team Why Do We Have to Fight at All?. There is really no good solution to the Sokovia Accords and the complicated world our superheroes have been brought into. But having more regulations definitely will help keep the human population safe. My only hesitancy about a superhero database is what would happen if it was put in the wrong hands--S.H.I.E.L.D. was Hydra, after all, so we've seen what evil can do and how sneaky it can be. However, I do believe that working on regulations helps protect both superheroes and the general population. Finding a happy medium between complete freedom and complete security is the plan I'm most in favor of. Ultimately, however, there is no true, good solution, and finding a happy medium may be difficult. The Marvel universe is complex now with more gray areas than ever before, and that's part of why I love it so much. Neither Team Cap nor Team Iron Man have it all correct, and that's what makes this battle so heartbreaking. In the end, I'm Team Crying a Lot, and that's exactly what you can find me doing in the theater this weekend. To be honest, I've had a really difficult time choosing sides for Civil War. Both sides have really good reasons and strong teams! Tony has seen what can happen when the team is allowed to do things without supervision and understands what the price is for everyone, Avenger or civilian. For him to say that the Avengers need an accountability system makes a lot of sense. Steve has trust issues with people dictating what he (and the team) can or can't do. The SHIELD/Hydra reveal only further reinforced his idea that the best way to keep the world safe is for the Avengers to act without interference from other people who might use them for their own motives. The following jokes about my 'Team Cap' stance being a cover for my actual #TEAMBUCKY lifestyle (not that I'm guilty *cough*) give way to, "But I like Tony!" Well, I like Tony too. And I completely understand his stance - I just disagree with it. When someone asks me if I stand with Captain America, I echo Bucky and say, "Hell, no. That little guy from Brooklyn who was too dumb to step down from a fight." I stand with Steve Rogers. 1. Bucky Barnes: Steve Rodger's loyalty to Bucky is admirable. He simply cares for Bucky and wants to help give him a second chance. If the public were made aware of Bucky's identity, the things he did while brainwashed would likely come to light as well. There are quite a few heroes with questionable pasts that the Act would put in danger if their identities and pasts were made known. The public doesn't always tend to care about why something happened, just that it did. 2. "Just give me some peace and quiet": Heroes like Clint Barton just want to live normal lives outside their heroism. This is often for the sake of their family or their own sanity. If you were gifted with extraordinary abilities and were just trying to do some good in the world, I'd think you would want a safe place from being misunderstood. I know I would. 3. Thunderbolt Ross: This is a man with a personal vendetta against heroes, particularly the Hulk. He is a man with power and a bone to pick that seems as if he will do anything to achieve his goals of controlling any person with powers, even unethically. Considering he was in charge of the Gamma radiation study that caused Bruce to become the Hulk in the first place, the element of wanting to cover up his own mistakes may be a factor as well. Yes, superpowers can be a risk to civilians, but so are freaky alien things, deranged figures of Norse Mythology, and murderbots. Against those odds, I would take a bunch of deeply flawed and human heroes any day. At the end of the day, I will always be Team Cap. I'm too much of an idealist not to. Every once in awhile, I’ll hear on the news about some vigilante who decided to take justice into his own hands and ended up getting people killed. There’s a reason people say to leave crime fighting to the professionals. Luckily, the Marvel heroes have a professional level of skills and sense of responsibility. At least, the main ones we hear about, such as Captain America or Black Widow. But the Marvel universe is more true to life than we’d expect. And for every responsible hero out there, there are a few dozen more lacking the stability and maturity to use their powers without killing innocent civilians. Turns out acquiring magical powers from freak accidents isn’t quite the same as years of professional training. That’s why heroes need to be kept accountable. It’s not about limiting freedom. It’s about keeping innocent civilians safe from the metahumans who don’t know what they’re doing. Law and order exists for a reason. And I believe organization, documentation, and training is the best way to ensure all heroes can carry out their destinies without endangering those around them. Superheroes should be allowed to be superheroes. But no civilian deserves to die when some paperwork and a few training sessions could prevent it. That’s why I’m Team Iron Man. Ten years ago, I didn't know who Captain America was. I didn't know who Tony Stark was either. In fact, I had very little knowledge of any superheroes other than the ones with movies before 2008. But then, in 2006, I was introduced to Captain America. And to Iron Man. And all the rest. I was introduced to so many superheroes I couldn't even list them all. Eventually, I fell in love with Steve Rogers and with Tony Stark and all the rest. Most importantly, I fell in love with superheroes and their stories. As Amanda said in her post earlier this week, superhero stories "reflect life on a larger scale." They dive into the deepest issues, the most painful and most beautiful parts of life, the most profound truths of humanity. The greatest thing about the Civil War comic event (and I hope the movie) is that both sides are equally explored. The reason it's so hard to choose a side is because both are valid, both are reasonable, and both have merit. Tony Stark is not a villain for wanting to protect the people and his fellow superheroes. Steve Rogers is not a rebel for wanting to protect the people and his fellow superheroes. They both have the same goal; they just have different perspectives. When people have different perspectives, there are different ideas for a solution to the same problem. Civil War is the result of those differences. For me, I will always choose freedom over security. It may be risky or more dangerous in the end. There will be tragedy and chaos at some point. Perhaps it won't end in a state of hallowed peace in the world, but it's freedom. It's the freedom to choose. It's the freedom to be. It's the freedom that the United States was founded on. (Can you tell who my favorite superhero is yet?) It's important, to me, that people have freedom. So am I Team Cap or Team Iron Man? I want to say both. I want to say don't fight because I've read the end of the story, and we all know it might not be worth it anyways. But I can't. If I have to choose, I choose freedom. I stand with freedom. Whether that's Steve Rogers, Natasha Romanoff, Matt Murdock, or Tony Stark: I choose freedom.